"If with all your hearts ye truly seek me, ye shall ever surely find me," thus saith our God. 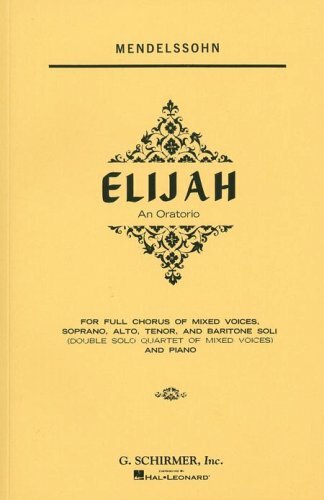 These are lines from Mendelssohn's oratorio ELIJAH. The scene is one of famine and misery for the people of Israel. No rain, no water, no food. The people sing "HELP, LORD! Zion spreadeth her hands for aid but there is neither help nor comfort." Things are looking bad, real bad. But the prophet Obadiah comes and points them in the right direction. "Ye people, rend your hearts and not your garments. For your transgressions, the prophet Elijah hath sealed the heavens through the word of God. I therefore say to thee, Forsake your idols. Return to God for he is slow to anger and merciful and kind and gracious, and repenteth him of the evil." Then comes the fabulous tenor aria. "If with all your hearts . . . . (see above)" WHAT A MOMENT! Well, not many of us are experiencing hunger due to famine. And when we hear "Forsake your idols," we're not thinking of the bronze sculpture on the mantle piece. But there are so many areas in our lives where we need to "RETURN TO GOD" and "SEEK HIM WITH ALL OUR HEARTS," knowing that he is slow to anger and merciful and kind and gracious. WOW!